In 2017, home values on average went in only one direction: up — and there’s more growth yet to come. 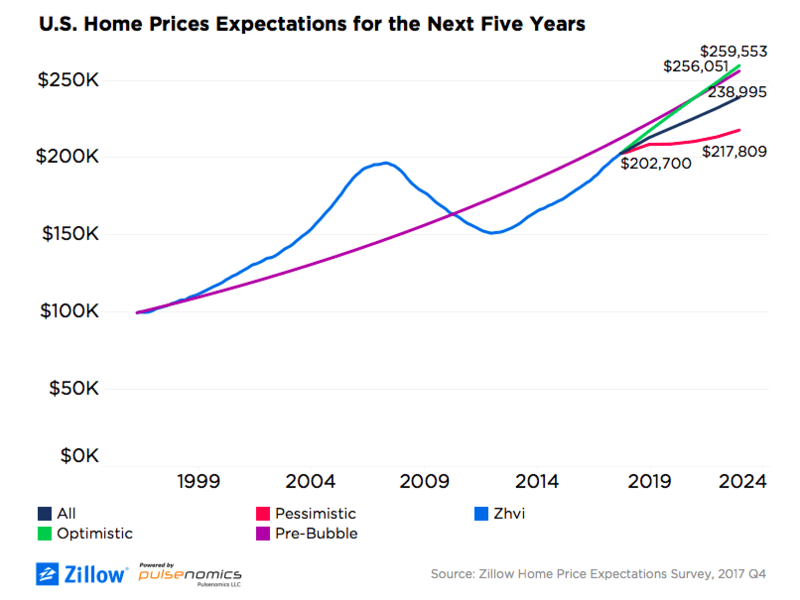 According to the Q4 2017 Zillow Home Price Expectations Survey, based on responses from over 100 economists, academics and housing experts, values will have risen 5.6 percent on average by year’s end. In addition experts are now revising their 2018 predictions to account for the continuation of scarce inventory and low mortgage rates, market conditions that only serve to increase values. At the end of 2016, panelists projected a rise in home values averaging 2.97 percent for the year 2018. But they’ve adjusted their expectations, saying that vales should grow at a rate of 4.1 percent next year, falling between realtor.com’s 3.2 percent and the National Association of Realtor’s 5.5 percent forecasts. “Home building has not kept pace with this surge in demand and remains well below historical norms. We don’t expect that these demand-supply imbalances will fundamentally shift in 2018: Demand will continue to grow and, though supply should increase somewhat, we still won’t build enough new homes to meet this demand, contributing to higher prices.